Smashing together subatomic particles at tremendous speeds is a pretty good way of increasing our fundamental understanding of the Universe. That's why people get excited about the results coming out of the Large Hadron Collider at CERN, which recently reopened after being granted a significant power boost. But China is now planning the next generation of particle accelerator - which will be twice the size and seven times more powerful than the one at CERN. Construction should begin in 2020, according to Chinese state-run media, with the final designs on schedule to be completed by the end of 2016. 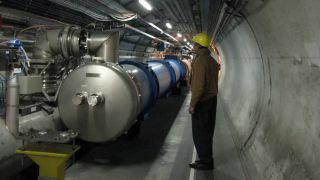 The facility should be capable of generating millions of Higgs boson particles - way more than can be produced by the Large Hadron Collider, which discovered the particle back in 2012. It's thought that the Higgs boson is one of the fundamental building blocks of the Universe. Wang Yifang, director of the Institute of High Energy Physics at the China Academy of Sciences, said that Qinhuangdao - a port city to the north-east of Beijing where the Great Wall begins - would be an ideal location for the facility due to favourable geological conditions. "LHC is hitting its limits of energy level. It seems not possible to escalate the energy dramatically at the existing facility." Wang told the China Daily. "[Ours will be] a machine for the world and by the world: not a Chinese one." Would you like to play this 3D-printed 'zoolophone'?